Thunder started the weekend on the right foot by winning their sixth game in a row against Charlotte Bobcats on Friday night (82-99). Humble Durant left the game earlier due to a bruised left shoulder; an injury which is not believed to be serious. Even though he was taken to the locker room, Durant still managed to lead the team by scoring 25 points. Fresh from the bench, Harden scored 21 points while Westbrook contributed with 18. Serge Ibaka had wild numbers: 12 points, 13 rebounds and five blocked shots. "Our offense was out of sync for some reason tonight but our defense was solid and we really picked it up defense in the fourth quarter"- said coach Scott Brooks. Thunder's biggest lead of the night (94-79) was made the moment Westbrook stole an inbound pass that was finished with a dunk. "Russell got himself going on the defensive end. He got the big steal and basket in front of their bench late in the game and I thought that was really big" - mentioned Brooks. 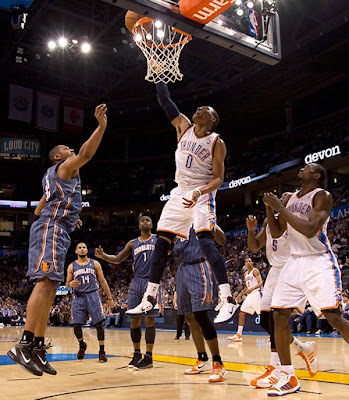 This victory increased Thunder's winning streak to a season best, six games. This game also marks the fourth straight game that OKC managed to hold opponents under 90 points. Thunder is playing against Toronto Raptors on Sunday.